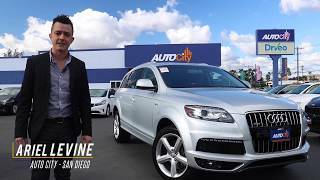 The 2012 Audi Q7 3.0T S Line is a big meaty SUV that offers a little bit of almost everything to the customers. The car comes with the three essential qualities that SUV customers look for in their cars – luxury, on-road and off-road capability. But don’t get fooled into believing that the 2012 Q7 excels in all these areas. The fact is that although it offers everything that a good SUV should offer, its performance in all these areas is rather mediocre. The 2012 Audi Q7 3.0T S Line can be perfectly described as “jack of all trades, but master of none”. Although somewhat similar to the Volkswagen Touareg and Porsche Cayenne, the 2012 Q7 is a little longer than these two vehicles with a seven seat three row configuration that makes it a slightly better family vehicle than these two models. Overall look of the Q7 is not disastrous at all, but it is no head-turner either. As far as look is concerned, the 2012 Q7 takes the middle ground perfectly where it appears muscular yet sophisticated according to some parameters. 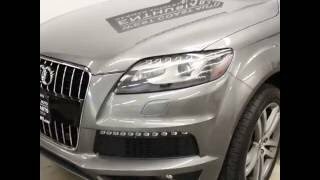 On the inside, the 2012 Q7 has a luxurious feel about it and that feel is primarily given by the rich leather suede as well as features like panoramic sunroof, extended leg rooms etc. The second row of seats has been perfectly designed for adult passengers, while the third row has been kept for kids. One can get a cargo bay of 88 cubic feet if the second and the third row of seats are folded. The only problem is the rather high floor of the cargo area compared to other vehicles in this class. 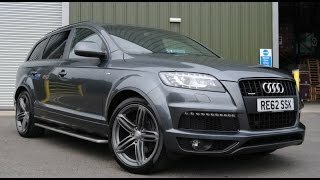 As far as engine is concerned, the Audi Q7 is powered by 3.0 liter V6 supercharged engine in the base version. This engine is capable of giving out a max output of 280 HP. In fact, this particular engine is offered in two different power levels, where this same engine produces 333 HP in the higher trim. The diesel version of the Q7 is powered by a V6 TDi engine, which produces 225 HP and a torque of 406 lb-ft. The plus point of this diesel engine is its fuel economy which clocks at 17 mpg within city limits and 25 mpg in the highways. All-wheel drive is a standard feature in all the variants. What is most impressive about the 2012 Q7 is its handling quality. 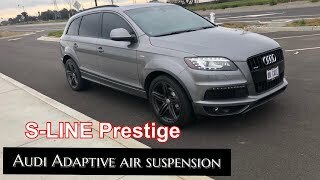 Both the handling and the riding quality of this particular Audi creation is simply superb thanks to the all-independent suspension. The car handles perfectly in all the driving modes – sport, automatic and comfort. Limited off-road capability of the 2012 Q7 3.0T S Line gives a rather rounded feel to this car’s performance. passenger expectations for functionality and comfort. a rolling Wi-Fi® Hotspot for up to eight passenger devices. programs delivers smooth shifts and fuel efficient operation. depending on the suspension choice, to aid fuel efficiency. panoramic glass to provide shade and minimizing heat entry into the cabin. the world of mobile broadband to the car for the first time. 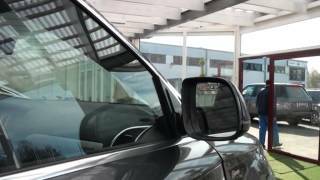 Audi connect also provides an industry-first factory vehicle integration of Wi-Fi service. innovative touchpad interface, or by using the system dial. streaming news feeds (available to view when the car is at a stop). lists and song titles via the Audi MMI system.